I don’t eat much bread these days. Its a pity because I like the taste of yeasty bread. Every since I was a young boy and my mother would bake bread or biscuits, I would beg for some raw dough. There was just something nice about the taste of wheat, salt, and yeast all together. I recently heard an interview of a man who has studied the history of fermentation and its impact on human culture. Every race and nation has used yeast and fermentation to create a wide variety of dishes and then developed many cultural observances around both the dish and the process. What the fermentation process did was to make some foods more digestible and available. I mean where would we be without beer, wine, bread, and cheese. When I started baking my own bread, I came to appreciate how versatile yeast could be. Of course, you have to learn to use the right amount and to keep it at the right temperature, but once introduced to the wheat, it was amazing how the yeast would permeate the lump of dough. Even though you would mix and knead the dough, the yeasties would only grow stronger. It was always fun to see how much the dough would rise and even after you punched it down, it would rise again. A little yeast would go a long way. There are many different kinds of yeast, but there is one that is the most powerful of all. It was used long before the first bread or wine was ever made. It affects all human activity and behavior. In Luke 12, Jesus speaks about this leaven, or yeast, and tells us to avoid it at all costs. He called it the leaven of the Pharisees, but it does not exclusively belong to them. This leaven is called by another name – hypocrisy. Let’s understand what this leaven is and what it is not. This is especially important since you often hear people accuse Christians of being hypocrites. A simple definition says that hypocrisy is the state of promoting virtues, moral or religious beliefs, etc., that one does not actually have and is also guilty of violating. Notice that there are two parts in this definition: first, promoting what you don’t really believe in, and second, failure to uphold what you really believe in. Given the virtues and values of Christianity, who is not guilty of violating them? Yet, I would hold that this is not a Christian problem, but a human problem. Someone said to me that they didn’t go to Church because hypocrites go there. I asked him if he went to the movies and he replied that he did. So I asked him if any hypocrites went to the movies and if so, why does he go there. The reality is that few of us successfully live out the values that we hold. If hypocrisy is an unavoidable aspect of life, what was Jesus warning about? The first part of the definition spoke about promoting what we don’t really believe in. In this sense, hypocrisy often involves the deception of others and thus can be considered a kind of lie. It is attempting to portray myself as something other than what I really am. In fact, in ancient Greece, the term was used to describe an actor who portrayed himself as something that he was not. Often this actor wore a mask to cover his true identity. So real hypocrisy is an intentional deception and intention implies a matter of the heart. Often Jesus upbraided the Pharisees because while they promoted a strict adherence to the rules (and Jesus had no problem with the rules), they neglected the most important aspect of the law-the heart. It can be this way for us. We come to worship, but our hearts are somewhere else. We follow the rules of the Faith, but we don’t really believe that doing so will make much difference. When we are this way, we have been filled with the leaven of the Pharisees. This is different from believing with our hearts, and striving to be true, but failing because of our weakness. The leaven of hypocrisy is always with us. No one lives up to what they profess. But lets avoid the leaven of the Pharisees where for the sake of pride, or prestige, or gain, we wear a mask in order to deceive others. Gratitude is more than attitude! We have just passed the season of Thanksgiving, and now we come to the Christmas season. It is (or should be) a time of joy and gratitude. In fact, so many carols speak of this joy and gratitude. it would be hard to list them all. So, it seems odd that in this season, we are told the story of the ten lepers. What does this have to do with the wonderful message of Christmas? After they were healed, only one came back to Jesus, and he was a hated Samaritan. The Fathers say that this shows how the Jews rejected Jesus, but He would be received by the Gentiles. This is historically true and important for we Gentiles, yet what always puzzled me was why only one returned to thank Jesus. To be healed of such a thing would, I imagine, raise incredible feelings of relief and gratitude. Today, it would be like suffering from AIDS and then finding yourself healed in one day. Gratitude would hardly express what you would feel. So, only one returned? Incredible. When we speak from a personal perspective, all of us are lepers. All of us have a disease that disfigures our hearts and minds to the point that we too are often unfit to keep company with others. Those of us who have come to Jesus find healing and restoration. What is our response? Have we just gone on with life, thankful for whatever blessing we have received, but living as we please; or, have we returned to express our gratitude to him by our obedience, actions, and deeds? Jesus always appreciates the gratitude that we feel towards him, but what is real gratitude? It is a life that shows appreciation by what we do and say. Often, when Jesus healed someone, he would say “Go and sin no more lest a worse thing happen to you.” I don’t know what happened to the nine lepers. I hope they lived a good and happy life but I am sure that if they were capable of such ingratitude, it may not have gone well for them. Despite all the arguments between denominations about what is necessary for salvation, Jesus said, “He who loves me keeps my commandments.” It would take a long time to discuss the commandments of Christ and how we live them, but the point is that gratitude is fundamentally an act of love, and not just of feeling. When we live in such a way that we are outside of his commandments, we show our ingratitude for all that he has done for us. This is why we find the word “ingratitude” on the list of sins to be confessed. Ingratitude is not so much a feeling as a way of living. Forgive me for saying this but given the material, financial and social blessings that we Americans have received, we must be the most ungrateful people who ever lived. So, healed lepers we may be, but do we express our gratitude? Will it be shown by the quality of our discipleship: or, having been healed of our disease, we leave to go live life in way that seems right to us, without much thought for the will of the one who heals us? Well, like all things, its up to us. There is no greater witness than this: “once I was blind, but now I see.” St. James would add that if we can truly see, then we can show the truth of our healing by our obedience to God. Show the priest, show the family, and show everyone you meet, more by what you do than by what you say, but say it as well. All around us are lepers who long to be healed. We Orthodox claim that we are being healed. What do the other lepers of the world see in us? Sadly, the see many who talk about their healing, but who live like lepers. Frankly, the lepers of the world are not convince of our healing nor of the ability of the Lord to heal. Can you blame them? It is my wish that you have a happy Christmas season and that the Nativity of Christ will remind you again of the salvation that the Lord brings to us all. I know you will be grateful for family, friends, brothers and sisters in Christ, for our Church and for Holy Orthodoxy and even for the gifts given to you in love. Wonderful. Even more, let this deep sense of gratitude that you feel remind you of what has been given to you. Remember the story of the one who turned back, and resolve to show your gratitude to God by what you do for him. I was walking through the local shopping mall the other day. Being the Christmas season, I was amazed at how few shoppers were walking around. I happened to pass by the mall Santa who was sitting alone with not a child in sight. He looked very bored and a bit tired. When he saw me, he smiled and waved, so I waved back. I suppose that being an Orthodox priest in my 60s, I have that Santa look that resonated with him. 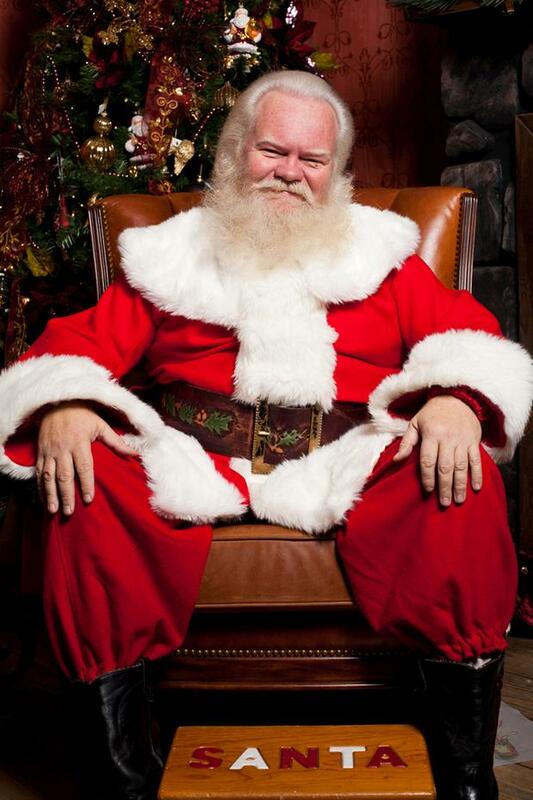 He wasn’t a large man, but he had a natural white beard and he looked good in his red suit and black boots. So, since I wasn’t in a hurry, I walked over to chat with him. After exchanging the usual niceties, he asked me if I had ever played Santa. I told him that I had only done it once when I was a much younger man. He told me I should apply next year and earn some extra money. I smiled and said that I couldn’t do it for a couple of reasons, but mainly because I honored St. Nicholas and I felt that the idea of the modern Santa was a corruption of this great man. The mall Santa looked a bit perplexed and said that he knew of “jolly old St. Nicholas.” I thought I should enlighten him a little, so I asked him some questions. “When did St. Nicholas live? What century?” I asked. “The 12th century or the 13th, maybe?” he replied. “What was he known for? What made him famous? With each question, the mall Santa seemed to get more and more uncomfortable, but I pressed on. I went on to tell him about the impact of the poem “The Night before Christmas” and the impact of the advertising campaign by Coca Cola. I asked him if St. Nicholas was alive or dead and he responded that if he lived in the 4th century, he was most surely dead. I smiled and responded that anyone who is with Christ is most definitely alive, for Christ is not the God of the dead, but of the living. So, St. Nicholas was most definitely alive. I could tell the the head of the mall Santa was about to explode, when a family with small children came up to see Santa. Santa seemed much relieved so I shook his hand and told him that should he ever want to know more about the real St. Nicholas, he should do some research and even better, he should come out and visit the Orthodox Church. P.S. An Orthodox friend calls this modern day “icon” of St. Nickolas, St. Consumo. If you ever get a chance, take time to inform the Santa at your local mall. Lucy in the Sky with Lucy Cats! 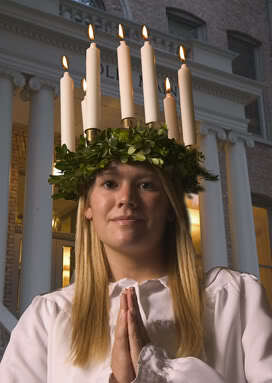 Growing up as a Methodist, I never learned about St. Lucia, or St. Lucy. Oh, I heard the song “Santa Lucia”, but it seemed to be more about an island, or some place where the author lived. Even after becoming Orthodox, I didn’t encounter St. Lucy until I visited a Bulgarian Church and they happened to be celebrating the feast of St. Lucia. After Liturgy, we went to the parish hall where a young girl in all dressed in white and wearing a wreath lit with candles came into the room while the people sang the song “Santa Lucia.” She had three for four young girls as attendants and they were all dressed in white as well. They handed out small cakes to everyone and I experienced my first “lussekatter” or “Lucy cats.” It was fun, but I still had no idea what it was all about. So, I took the time to read from the lives of the Saints about this pious and courageous young woman. She lived in the 2nd and 3rd century in Sicily and gave much of her wealth to the poor. She was promised to a pagan groom but refused him and so he denounced her to the magistrate. I read of her bold witness before the Roman judge and how no threat of torture of defilement could move her. In fact, when the men came to move her, she was so filled with the Holy Spirit that no one could move her. They tugged and struggled. They tied ropes to her hands and feet and many men worked together to pull her, but they could not. They lit fires around her, but she would not burn. They finally wounded her when they tried to behead her, but she continued to speak until after she had received communion. Then she gave her soul to God. Its a truly remarkable story. Well, there have been many remarkable saints and some we remember more than others. Some we celebrate yearly, and others we rarely celebrate. Why do we remember this faithful young virgin each year? The answer lies somewhat in her name. The root of her name is the same as the root for the word “light.” The witness of St. Lucy overcame the spiritual darkness of her day as her name proclaimed her to be a child of light. The question remains as to why we celebrate her this time of the year. We lived in the North of England for three years and that area is on a parallel with Hudson Bay, Canada. For people from Virginia, it was really far north. In the winter, it amazed us how quickly it would darkend in the evenings. Well, according to the Julian calendar, Dec. 13 is the shortest day for light and longest for darkness. In Scandinavian countries and areas like Scotland, the evening darkness during this time of year can be deep and long. Is it any wonder then that these people would venerate a saint whose very name meant “light?” In fact, even after the Reformation, many of the German Lutherans continued to have Lucy festivals and liturgies. While the Gregorian calendar has moved this celebration to Dec. 26, her celebration helps us to rejoice in the light even in our darkest moments. Certainly, the balance between physical darkness and light is but a symbol of the balance between spiritual light and spiritual darkness. But isn’t it interesting that in the face of lengthening darkness, we want to celebrate? So, in our celebration, St. Lucia visits us with lights like a halo around her head, dressed in the white of purity. In the face of the long darkness, she gives us….ah…pastry? St. Lucy, pray for us who have eyes but do not see, for we fear the darkness. Now for a Lucy cat! You are currently browsing the Ramblings of a Redneck Priest blog archives for December, 2012.